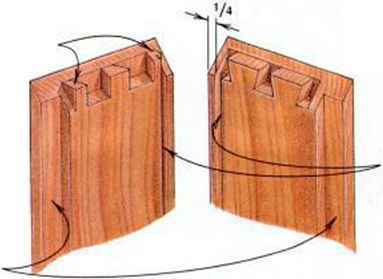 The blind mitered dovetails that join the clock case are very strong, but they do not detract at all from its simplicity. 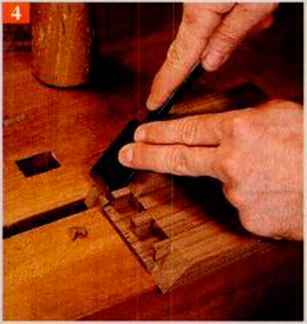 I suppose you could view them as an example of Shaker humility— accurate layout, sharp tools, and a bit of skill will result in a well-made joint nobody will see. Baselines, miter lines, and rabbets— Use a marking gauge to scribe baselines on the insides of all the case pieces. Make each baseline as wide as the piece is thick. Next, lay out a miter line on both edges of each end. The miter line starts where your baseline meets the edge of the board, and it must exactly intersect the outside corner of the board. The case is joined with blind mitered dovetails, as shown in the sidebar above. Before you cut any joints, dimension, plane, and scrape both sides of your stock. Also sand the inside surfaces at this point—doing so after dovetailing risks jeopardizing the fit of the joint. 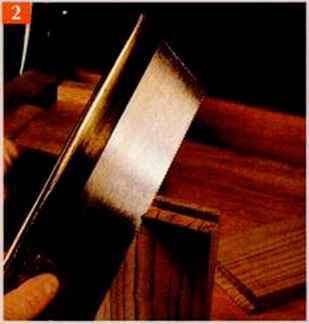 a back saw, securing the work against a bench hook. I used chisels and a sharp rabbet plane to clean up the rabbet. The pins—Because of the rabbet, I couldn't use a sliding T-bevel to lay out the pins as I usually do. Instead, I made a stiff paper template and indexed it over the end of the rabbet. Use a marking knife or thin leaded pencil to mark your pins, and mark the waste with an "X" to avoid confusion. (See Q.) Be sure to account for the rabbet in the front edges that will hold the door, and the groove on the inside edges that will hold the back in place. The drawing opposite will guide you. 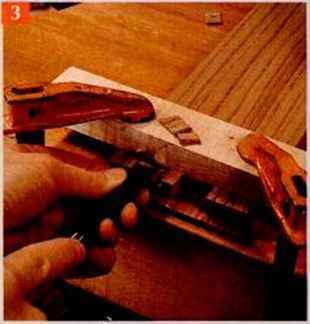 To cut the pins, hold your saw at a fairly steep angle, and saw on the waste side of your layout lines. (See Q.) You needn't worry if the saw cuts lightly mark the lap—you'll miter the lap soon. Sawing protocol. Keep your saw at a steep angle, and cut on the waste side. Don't worry about shallow marks on the rablyet lap. After you've cut the case joints but before assembly, cut the rabbet for the door and the groove for the back ot the case. To make the rabbet, 1 used a 4^-in. dado set on the tablesaw, and cut ty^ in. deep. I sawed the groove in. wide and in. deep. This is also the time to put the -V^-radius bullnose on the case's front edge. 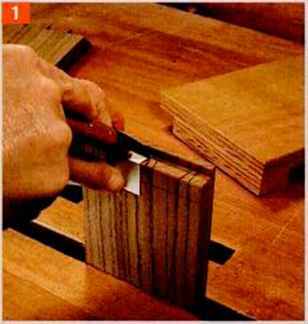 You can use a router or a hand plane to make the bullnose. Cut the V^-in. birch plywood back to size, and then you're ready to glue up the case. Clean up any waste with sharp chisels. I like to clamp a square, hardwood guide block across the stock at the baseline, to guide the chisel on downward cuts. (See Q.) First chop straight down against the guide block, to form a stopping mark. Then pare in from the end of the board to remove the chip. Keep doing this until all the waste is removed. You've reached final depth when you've pared to the thickness of the rabbet lap. Pare to the rabbet lap. Carefully pare down to the thickness of the rabbet lap. The clamped-down lyoard sup-ports the chisel on downward cuts. joints tend to be self-squaring, especially with the back fit into its groove. When the glue is dry, final-sand the exterior of the case. lay out the pins. Make a stiff paper template to lay out the pins first. Note the lap left behind the pins—evidence of the rablyet cut before joint layout. Second, miter lhe in-between part— Ihe remaining length of the lap created when you cut the rabbet. (See HI.) This step gets rid of any saw marks you made in the lap. To make the mitering template for this portion, saw a piece of hardwood, wider than the case sides, to exactly 45\ Then clamp it in line with the end of the case sides. Guide a sharp rabbet plane or chisel along it, and you'll trim the end to a perfect miter. The tails—To lay out the tails, superimpose the pins on your tail piece. (See 0.) Be careful to line up the pins with your tail baseline. As with the pins, mark with a layout knife or pencil, and put an "X" on the waste. Sawing, chopping, and paring is the same as for the pins. And once again, there's no need to worry about shallow-saw marks in the lap, since you'll cut the miter soon. Use the same mitering templates as before to get an accurate miter above and around the tails. With tails and miters cut, you can dry-fit the joints and touch them up as necessary. Then cut the rabbet for the door and the groove for the back of the case. (See main text.) —R.T. Miter the ends. Saw, then pare away the "chunks" outside the pins. A mitered template wraps around the stock to guide your chisel. Miter the middle. 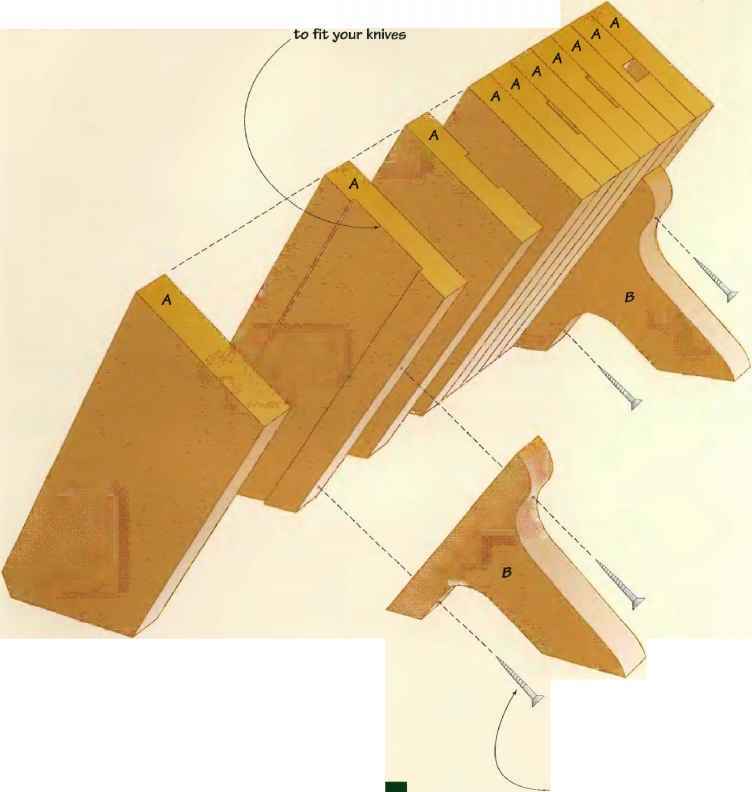 Another template guides the rabbet plane as you miter the length of the rabbet lap. This removes stray saw marks on the lap. Use the pins to Liy out the tails. Scribe your tail lines by holding the adjacent pins carefully against the baseline. both rhc project and the finished picce more interesting. Mitered top half—Make the mitered frame for the top p.in of the door first. Given the mitered dovetails that join the case, you might assume a sophisticated joint for the door. Not so: I cut the frame joints on the chop saw and reinforced them with #0 biscuits. (The I.uddite in me cringes to admit it.) But a hand-cut lapped miter is also a good choice. After you've cut these joints, glue up the top half and set it aside to dry. You'll chop the mortises for the botrom half and cut the circle for the glass later. Now turn your attention to the bottom portion of the door. After dimensioning your parts, plane or rout the round-over along the inside edges of the frame members, and on the bottom edge of the mitered frame. Also cut the groove for the panel. 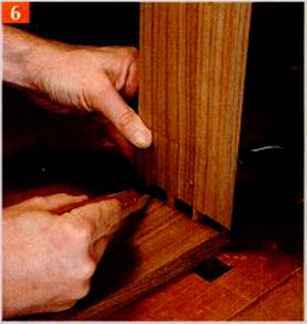 The width of this groove—V4 in.—sets the thickness of the tenon and the width of the mortise. A tenon saw is my tool of choice for cutting the tenons. Clamp the picce to be tenoned in a vise, pointing up and away from you. Start the cut in the near corner, sawing down along the waste side of the line on the edge and end of the board. (Sec top photo, page 62.) Stop when you reach the shoulder line. Then reposition the work so it points toward you, and make the corresponding cut. 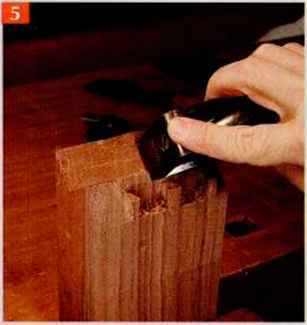 Make the final cheek cut with the work held vertically in the vise. The two previous cuts will guide you.